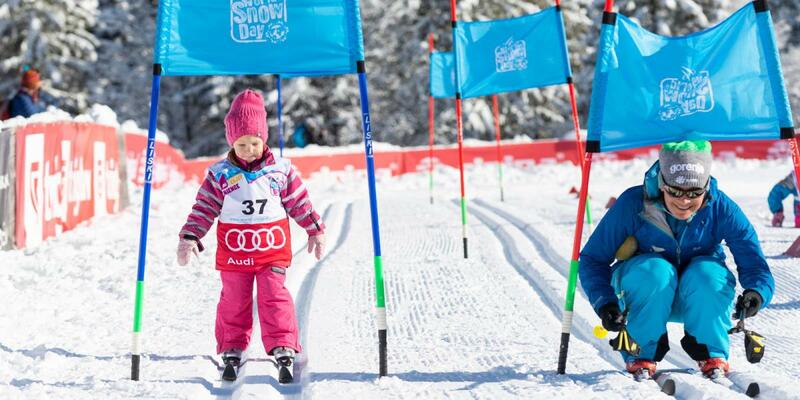 The World Snow Day in Planica has become a real winter treat for children. On January 19th and 20th, 2019, the valley below Ponce hosted the World snow day event for the eighth time in a row. The event was designed for children of all ages, although some bold adults also took part in it. The latter especially took advantage of the opportunity for free cross-country skiing lessons. The emphasis was on promoting Nordic sports, ski jumping and cross-country skiing. Accompanied by proffesional ski jumper, Cene Prevc, we made two ski-jumping hills of different sizes for children at the landing slopes of the small ski-jumping hills. In the outrun of five smaller Planica ski-jumping hills we arranged the cross-country ski trails, and in its immediate vicinity we set a snowbound football field, a snowboarding polygon with Zan Košir, olympic medalist, and a sledge field. The children were able to borrow the entire equipment free of charge, and professional guidance and excellent animation of the event were taken care of. 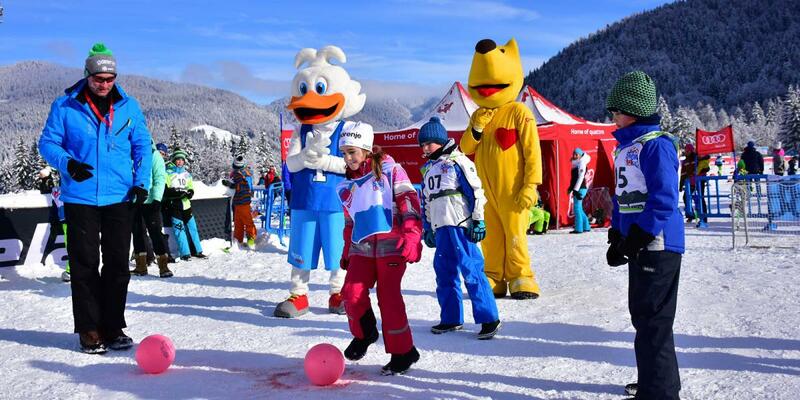 In addition to sports activities, we provided visitors with a lot of fun with mascots, instant production of photographs with Planica background, and social games for the youngest. Through a mini military polygon, children could also learn about the lives of Slovene soldiers. The real hit of the event was the search for the hidden treasure, which ended with running to the top of smaller ski-jumping hill and, of course, finding a sweet treasure. The amazing photo of this activity in Planica has also become the cover photo of official FIS World Snow Day 2019 multimedia news (https://www.fis-ski.com/en/international-ski-federation/news-multimedia/news/world-snow-day-2019-a-resounding-success). Undoubtedly, the event will be unforgettable for over 2.000 visitors. At the same time this weekend, at the Nordic Centre in Planica we also hosted two FIS Ski Jumping Continental Cups. 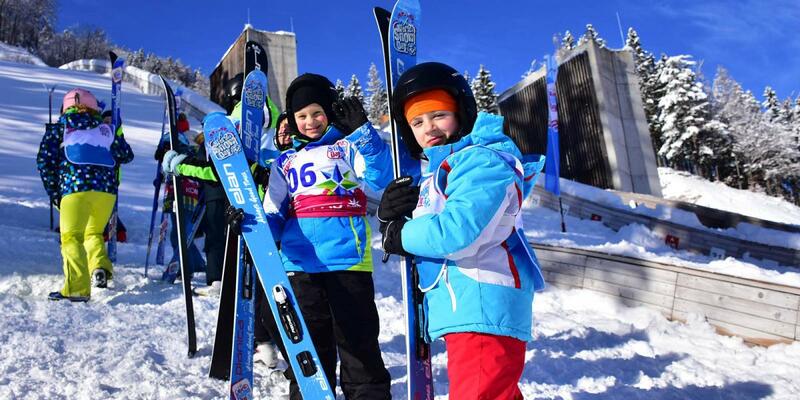 On Friday, January 18th, we also announced the World Snow Day weekend event in the Ljubljana inner city, as part of the Winter Sports events in Ljubljana, the Slovenian capital city. The number of our partners rises steeply each year. We have provided for delicious snacks, warm tea and great prizes, all free of charge. The event was also diversified by the many well-known mascots of our partners. A visit to the event was free for all visitors. We spent two exceptional winter days in the most beautiful valley of world championships. Our job is also to promote, during such events like World Snow Day is, two World Championships we host in the next few years, FIS Ski Flying World Championships 2020 and FIS Nordic World Championships 2023. We are more than ready and full of new ideas for the World Snow Day 2020. Having fun on snow. Kids on snow.